I will move out to another city next month. I should empty out my refrigerator, a reason why I decide to cook a whole month now (beside I also get broke while moving out in Japan is drain your wallet). So, I become a loyal follower of “LINE recipes”. They give lots of easy recipes. You should try to visit, it is mainly in Japanese but while they give short videos, you’ll easy to understand. Today I tried to make my favorite food: roll cabbage. 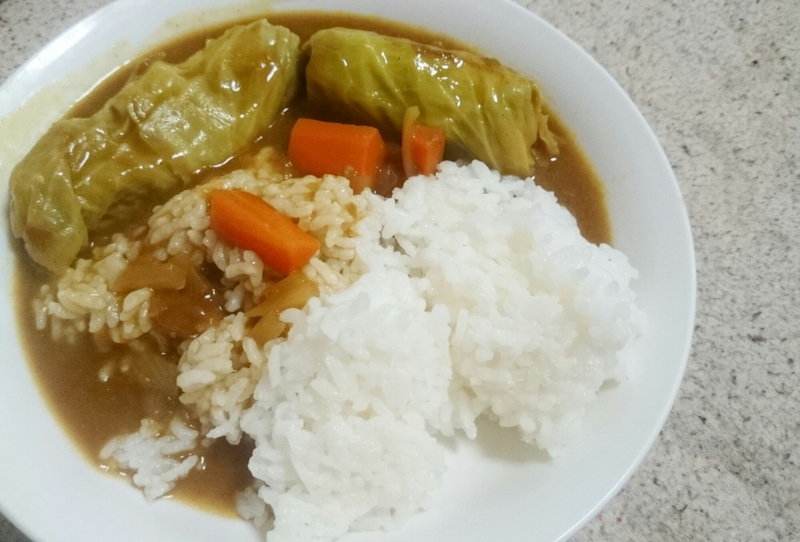 I am dying here in Japan because it is so hard for me to eat cabbage roll because the filling are always meat (I can’t eat non-halal meat 😦 a bit tough isn’t it?). Then I found the recipe. And really surprised because it is very easy to handle :p. I bought halal minced beef and then start my experiment! I marinate the beef with minced onion and garlic so I can add the savory and kill all of bacteria on it :] it will make your dishes healthier. Then mix this with paprica powder, minced carrot, salt, and pepper. After finish, heat it again into the microwave for 5-10 minutes. Depend on your cabbage roll size. As the combination, I use my japan style vegetarian kare block to cook my kare. After ready, I mix my kare with this lovely cabbage roll. It is so simple but I can stop to smile and proud to myself. This dishes will taste best when it is rainy outside.